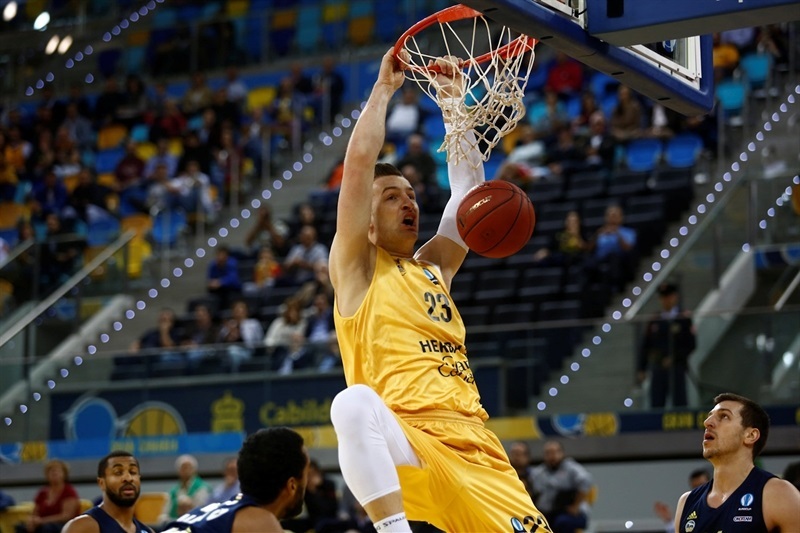 Herbalife Gran Canaria Las Palmas clinched first place in Group B and kept ALBA Berlin from advancing to the Eurocup Last 32 for at least another week by winning at home 83-78. 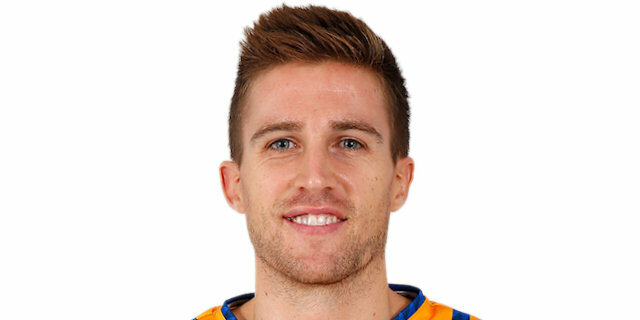 Gran Canaria had already qualified for the next round before the win, which improved its record to 7-2 thanks to 23 points and 5 assists from Kevin Pangos. Alen Omic collected 15 points, 9 rebounds, 3 assists and 9 fouls drawn in the victory, while Sasu Salin scored 12 points and Xavi Rabaseda added 10 points. 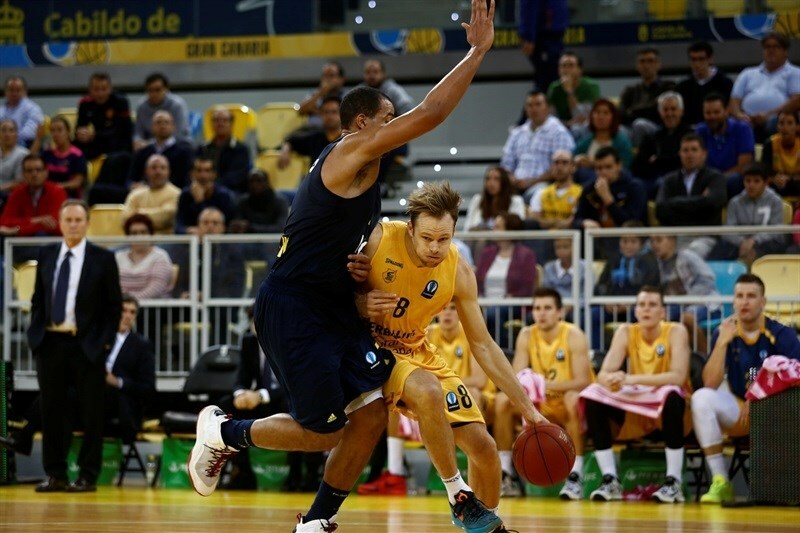 ALBA dropped its fourth straight game – after having won its previous four games – to fall to 4-5 in the group. Dragan Milosavljevic and Elmedin Kikanovic both scored 15 points for ALBA and Jordan Taylor picked up 12 points, five rebounds and four assists in the defeat. 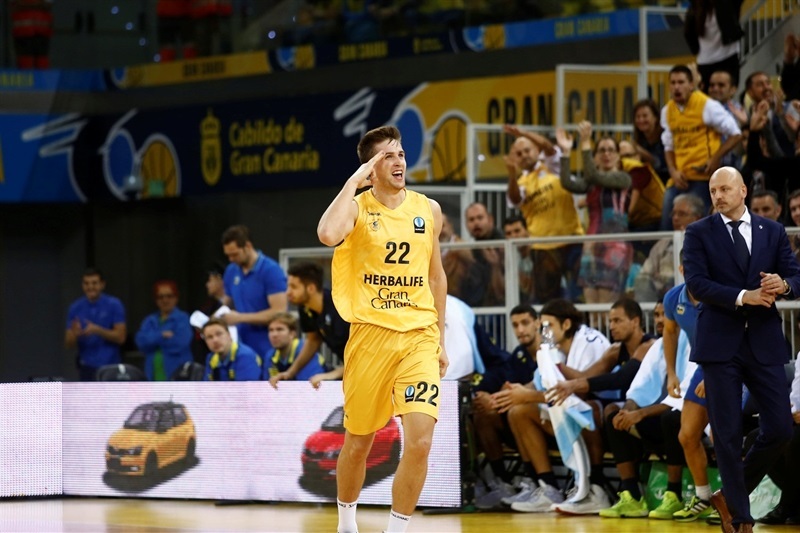 Kikanovic’s free throws opened the game for ALBA and Brad Newley evened the game before Pangos gave Gran Canaria its first lead 4-2. Ovidijus Galdikas scored and assisted on a Eulis Baez three-pointer before Pangos’s next basket increased the lead to 11-4. A time out did not help ALBA to score as Pangos’s free throws made it 13-4. Milosavljevic tallied to snap a 2:51 minute scoreless stretch for ALBA, but Rabaseda’s free throw made it a double-digit game, 16-6. Alex King and Will Cherry both nailed threes to get ALBA to within 19-14 and a three-point play from Kresimir Loncar trimmed it to 21-17 after 10 minutes. Jonas Wohlfarth and Michael Watt scored early in the second quarter for the guests and Ismet Akpinar nailed a three-ball and hit another score to put ALBA up 25-26. Pangos punched back with two triples to make it 33-26 with Milosavljevic responding with a long ball and Kikanovic’s free throw trimming it to 33-32. 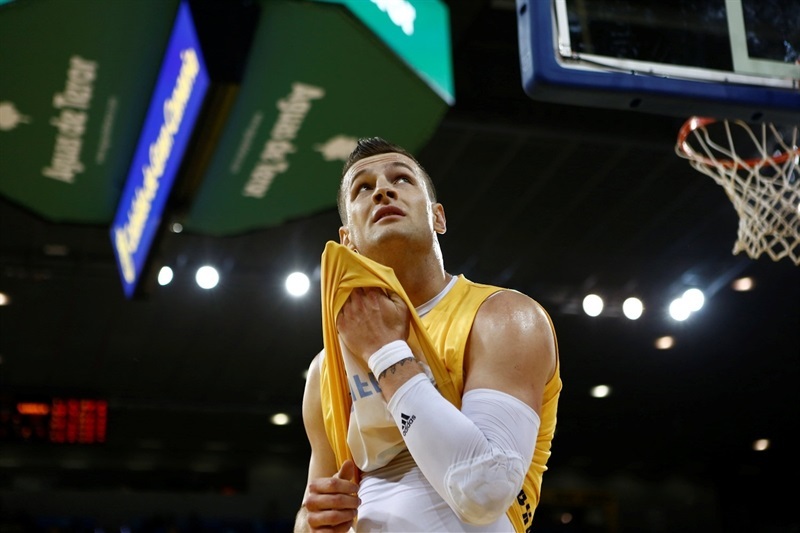 Rabaseda and Milosavljevic swapped three-pointers and then the game was knotted at 37-37 on a Kikanovic score. Milosavljevic’s free throw pushed ALBA ahead 37-38, but foul shots from Salin had Gran Canaria leading 39-38 at the intermission. The lead switched hands four times early in the third quarter with Sasu’s three making it 44-42. 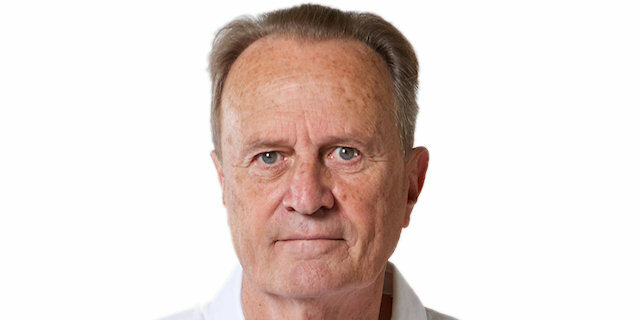 Sasu nailed another triple and a Pangos’s three-pointer had Gran Canaria up 51-42. Loncar’s free throws stopped the rut but another Pangos triple increased the advantage to 56-46. And Omic’s three-point play made it 59-46. The cushion was 63-53 with three minutes left in the quarter before Kikanovic collected 6 points in an 0-8 ALBA surge to close to within 63-61 through three quarters. The guests kept the momentum to start the fourth quarter as Taylor had a basket and 2 assists in helping ALBA jump ahead 64-67. After a timeout, Newley, Pangos and Rabaseda went back-to-back-to-back from long range to go up 73-69. Cherry knocked down a triple as ALBA moved to within 75-74 inside the four-minute mark. After Baez scored 4 straight points for Gran Canaria, Cherry punched back with another three to make it 79-77 with two minutes to play. ALBA failed to score on its next two possessions before Albert Oliver’s free throw made it 80-77 with 24 seconds left. Taylor split free throws with 18 seconds to make it a 2-point game. But Pangos knocked down both of his free throws with 15 seconds remaining and Milosavljevic missed a three-pointer with 11 seconds to play to end ALBA’s hopes. "Congratulations to Gran Canaria. They deserved to win, but we could have also come out of this game as the winners. I have nothing to complain about. I think that, as a team, we gave a maximum effort to win this game. It is never easy to win here. 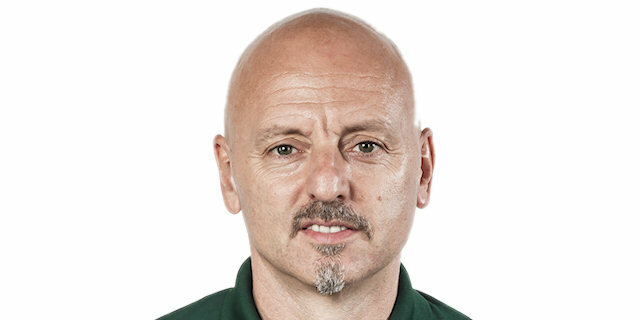 In the end, our chances to go to the next round depend on winning the next game, so we will try to do it."